“I came here from Illinois to get away from the snow,” said a smiling University of Tennessee student whom I met in late February at the campus University Center not far from downtown Knoxville. Being from Michigan, I told the sophomore that was also one of our reasons for visiting the area, especially in light of the siege-like winter in the Midwest. As they say, sometimes a change of attitude results from a change of latitude. But I digress. Here are some other arguments why a detour off I-75 to visit an oft overlooked and under appreciated Knoxville is just the medicine to shake the late winter blues. University of Tennessee—As readers of this blog have noticed, I’m a sucker for visiting college campuses, especially those close to the city. Only a short walk from our excellent hotel, the Holiday Inn at World’s Fair Park (more on that later), UT deserves some studied attention. A must stop is the expansive bookstore, teeming with clothing and objects branded with the school’s logo and iconic orange color. In a retail coup admired by my shopping savvy spouse, I found a sweater vest—nicely initialed for me with a simple orange T—in the clearance section for $10. We also toured Ayres Hall, one of UT’s original buildings, which sits on “The Hill,” majestically overlooking the area. Volunteer Landing— This lovely area along the Tennessee River is only a short walk and segue from the main UT campus. 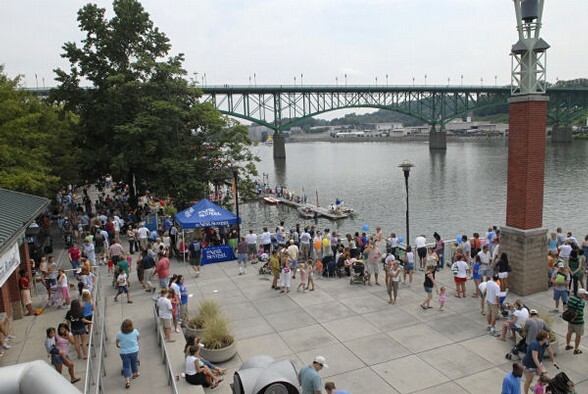 Boasting a visitor center, full-service marina, water play fountains, benches and restaurants, the city-owned Landing offers a refreshing one-mile river walk and stroll. At the marina, one can rent houseboats, pontoons and aqua cycles or book a river cruise. And the historical markers along the promenade are exceptionally well done, several with a literary bent such as one about Knoxville native and novelist Cormac McCarthy, best known for his No Country for Old Men which was later made into a film by the Coen brothers. Museum of East Tennessee History—this is simply a gem. It’s recommended to allot several hours early in your Knoxville visit to full appreciate the impressive displays, narratives and collection. Located in the heart of the walkable downtown, this most affordable ($5) museum is an ideal opportunity to grasp the state’s and region’s rich and fascinating history. With an array of interactive exhibits, it appeals to a wide-ranging audience and covers the Tennessee’s history from earliest Spanish explorers and natives to its pivotal roles in the Civil War, the TVA and atomic energy. Factoids abound such as: Tennessee was the first state (1796) created by the territorial process; it was named for the Cherokee town of Tanasi; in 1887 a huge fire destroyed downtown Knoxville but it was completely rebuilt and transformed into a retail center within a year. Market Square—One of old Knoxville’s key focal points and now a thriving pedestrian mall with several desirable restaurants and taverns. After leaving snowy Michigan and Ohio one day, we were delighted to dine outside for both lunch and dinner the next day, right on the Square. Using local online sources such as Metro Pulse as well as Yelp, we wisely chose the well-regarded The Tomato Head and Tupelo Honey Cafe, respectively. They exceeded expectations for menu selection, service and ambience. Entertainment—Relying on Metro Pulse, we took in a most pleasant concert on Friday evening by British folk singer David Clifton, bolstered by a superb back-up ensemble, at The Square Room, located fittingly just off Market Square. Opening for Clifton was local singer-songwriter Joey English who showed promise and earnestness in his set. Another bargain at a $10 ticket. Thanks to a notice in the UT student newspaper (another reason to visit a college campus) we caught a modern burlesque show at the Relix Theatre called the Pretty Things Peepshow. Based in NYC and traveling around the country, the show is indicative of a booming revival of burlesque which had its heyday in the early 1900s and lasted until the ‘60s. Compared to R-rated offerings readily found on HBO, etc., the Peepshow is relatively tame stuff with much camp and humor. Exotic dancers sporting pasties and stage names are mixed with sword swallowers, magic tricks and contortionists. And the emcee, Donny V, displayed a wicked wit and humorous repartee with the young audience. All in all, it was completely different and thoroughly fun stuff and we found it on a Saturday night in Knoxville. Go figure. Accommodations—The Holiday Inn at World’s Fair Park (in 1982, Knoxville hosted a World’s Fair) was ideal. 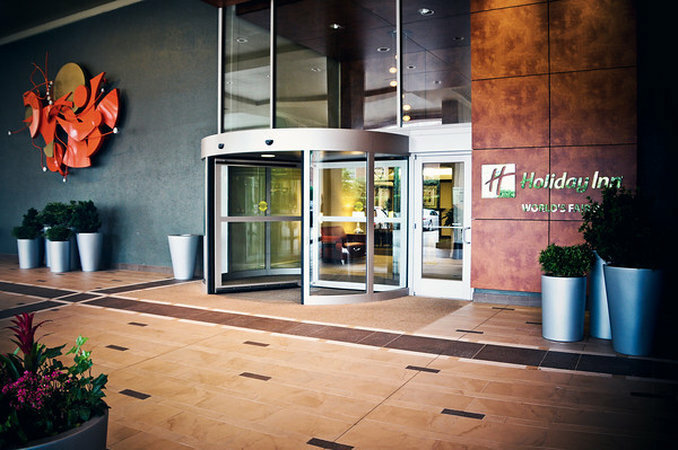 As they say in real estate, accommodations are often all about “location, location, location.” It’s also about “service, service, service” and the Holiday Inn was most admirable on both accounts. Apropos to its proximity to downtown and the UT campus, we arrived and parked our car on Thursday and didn’t need it again until we visited Oak Ridge on Saturday. In the interim, the hotel even provided a free shuttle service to guests to take them to and from downtown destinations. It was a nice perk as the drivers were friendly and efficient and genuinely enjoyed their duties. One driver even patiently waited for my wife to visit the main post office to mail a package. Another time, the shuttle driver transported us to church on Saturday evening and, later, to and from a restaurant outside walking distance. As a pastor might say, what a service! Staying on the Executive Club floor, we relished our well-appointed room with its workplace and desk, multiple outlets, satellite TV, and Wi-Fi. And the view overlooking the World’s Fair Park was scenic. Besides the ample and complimentary continental breakfast, I was also impressed with a couple of small touches about our guest floor and room. One was a nifty nightlight feature in the bathroom (hadn’t seen that before) and secondly, the leaving of fresh towels and shampoo outside our door after we had used the “do not disturb” hanger. 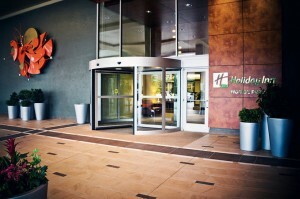 Located across from the Convention Center, the Holiday Inn is a popular and busy establishment. It’s a full-service, 286-room hotel with 22 meeting rooms, a fine restaurant and bar, a health and fitness facility, indoor pool, and a 24-hour Business Center. In short, it’s a hotel fit for a big city such as Knoxville. But like the many friendly people we met during our stay, it imparted a small-town, neighborly feeling. Heck, even if it snows in Knoxville we’ll be back. Visit www.ihg.com.